In what is another part of the story (technically listed as a prequel) to his 2002 horror film Suicide Circle (or club depending on which version), Sion Sono presents a stylish, artistic metaphor that's too dramatic and not scary enough to be a horror film, and too disturbing to be just a drama. Suicide Circle was the story of police in Japan investigating a series of seemingly unconnected suicides, particularly one involving 54 school girls who threw themselves into the path of an oncoming subway train. Here, we hear about the event, but the film follows a different set of characters. 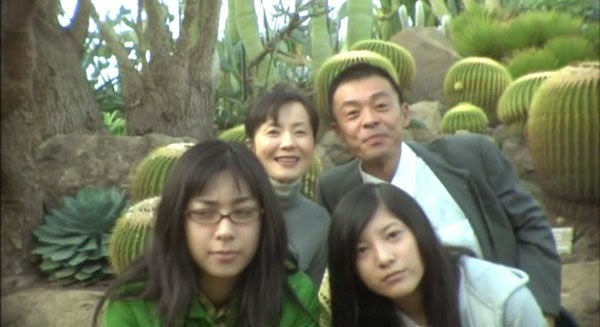 The story is told in 5 chapters, 4 of which are titled after one of the main characters: the eldest daughter Noriko (Kazue Fukiishi), her younger sister Yuka (Yuriko Yoshitaka), Noriko's friend and mentor Kumiko (Tsugumi), and Noriko and Yuka's father Tetsuzo (Ken Mitsuishi). Each chapter overlap and provide important new information as told by the narrator whose name belongs to the chapter. Noriko grows sick of her small town, and wants to go to Tokyo to find herself. She's encouraged to do so after creating the screen name (alternate identity) of Mitsuko, and meeting Kumiko online. When they meet in person, Kumiko shows her the locker where she was "born." Inside is a collection of random items that don't belong to her, but that she's created a story for. By this point it's clear that Kumiko is completely without a true self. Noriko, now going by the name Mitsuko, leaves an piece of string from her coat in the locker, calling it Mitsuko's umbilical cord, a symbolic "rebirth," leaving behind her previous self. As you can no doubt tell, this is already a dense film, full of symbolic meaning. As such, we are in the clear to leave surface meaning at the door. The mood begins light-hearted, like an indie, comedy drama (that looks somewhat stylistically inspired by the earlier films of Wong Kar Wai, and Jean-Pierre Jeunet's 2001 film Amelie), before slowly, subtly changing to a tense thriller. It's handled so well, and so subtly that it's easy to get swept along without noticing. Kumiko's work is called "family rental." She and Mitsuko, among others, act out parts for paying customers. If a man has lost his two daughters, and is willing to pay for it, he can hire Kumiko and Mitsuko to take their identities for an afternoon. The two must remain devoted to their roles, calling him "father," and do anything he wants to do. It's a study of identity, the roles that we play, in ours and other's lives, as well as the roles others, careers, and society impose upon us. Meanwhile, the media can't stop talking about the deaths of the 54 girls who jumped in front of the subway, and the numerous other reports of suicides around Japan. The father seems haunted by these reports because he doesn't know where Noriko has run off to or what's become of her. "There is no suicide club." It's told to us outright. What Sono means for us to see is the metaphor for how society, the media, those around us influence us to die to our "selves." Our individuality, our true self destroyed. Many begin by taking on a different "self" in the online world. We accept a new name. We adapt things from our friends, co-workers, and the latest trends told to us by the media. We get lost in our careers, losing sight of everything around us. We accept that the "top hits" on the radio are good, and that that's what we're supposed to be listening to. When someone allows so much of their life to be taken over by, or devoted to these "parts" within society, they forget who they were originally. Once you've lost all identity, you go around playing whatever part is needed, wherever it's needed. Some all too willingly accept the death of their "self." In one particularly graphic, disturbing scene, a young lady plays out her part to the literal death (of self). Allowing herself to die in her role. Those around them gleefully cheer for their friends death, and smile at the thought that they'll be next. The trend of committing suicide (again this is a metaphor for the death of the self, of individuality) had grown popular through the media, and online conversations. 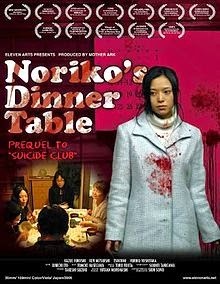 Noriko's Dinner Table lives within the metaphor, and we're given a thrilling family drama as the father searches to find his lost daughters, after Yuka leaves him to join Noriko. As the girls lose their individuality, the father plots to bring them back. His plan involves putting his daughters in a familiar place. Hoping it will remind them of where they came from, who they were, at their truest, rawest self before the influences tore their self from them. But that's not where Sono leaves it. He also recognizes that you have to live for yourself, and make your own choices, finding your own happiness. That's how the journey started for Noriko, but she was all too easily lost. It's a warning Sono gives us. We all have to leave the place of our upbringing at some point and make our own way, but we should be careful not to lose who we are. It's a lengthy film, at over 2 and a half hours, and it begins to feel every bit of it, particularly in a few scenes that drag on a bit, and seem to twist and turn unnecessarily. Having said that, the majority of this film is absolutely excellent. It will have you emotionally invested in the father's quest, and will always keep you guessing what's going to happen next. It's superb filmmaking, the likes of which we rarely see. It's inventive, stylish, and mysterious. The acting from all 4 leads is brilliant, particularly that of Tsugumi (who played Kumiko). Her ability to play, at times, multiple emotional levels at once, only to turn on a dime and play the next "role" that's needed of her is nothing short of awe-inspiring. Sion Sono took a complex metaphor, put it into a compelling story with rare craftsmanship. It's a thought provoking film that asks us to ask ourselves, are we connected to ourselves.